How Many Software Developers Are There In The World? Do you wonder how many software developers there are in the world? 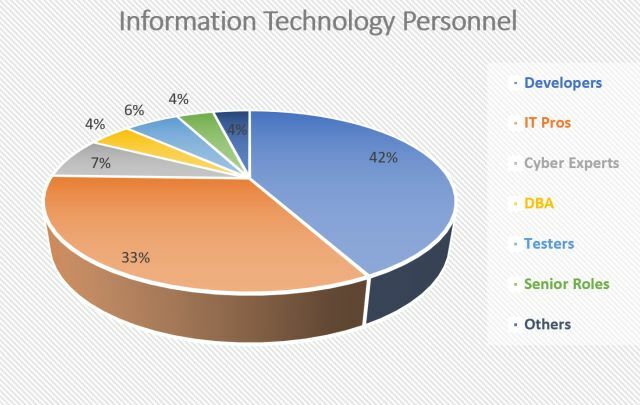 Here is a breakdown of all IT personnel in the world. Today, the world runs on software. Software is the glue that connects billions of people with 9 trillion devices worldwide. Software developers are the architects that are laying the groundwork and shaping the future. The IT sector has seen a steady growth year after year and will continue to grow at a 5% to 7% rate, according to Gartner. Gartner reports IT spending of $3.8 trillion in 2018. Among all IT products and services, Enterprise Software grew at an 11.1% rate last year and is expected to grow at an 8.4% rate in 2019. Do you ever wonder how many software developers there are in the world? 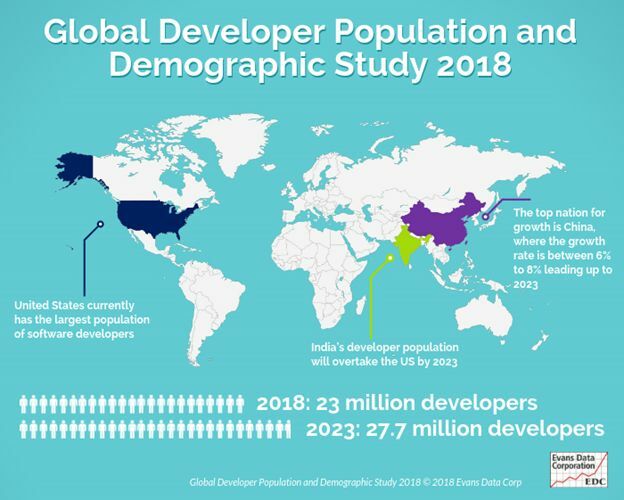 According to a study by EDC, as of 2018, there are 23 million software developers worldwide. This population is expected to grow to 27.7 million by 2023. Today, the United States is the home to the largest population of software developers, but by 2023, India will overtake the USA and will become the home of the most software developers in the world. If I were to guess, there are 40 million people who are involved in writing some kind of code. No matter if you call them programmers, coders, developers, front-end developers, back-end developers, full stack developers, database developers, app developers, or Web developers, they all write code. That’s the number I’m talking about. Software developers are not the only technology-related jobs. 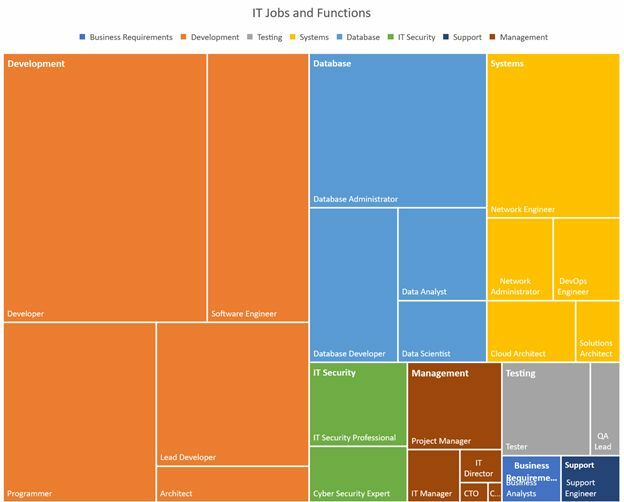 Computer Science, also known as the Information Technology (IT) industry, involves several job functions starting with business analysts to CIOs. We can break down the Information Technology sector into eight major categories according to their functions – Development, Database, Systems, Security, Management, Testing, Business, and Support. The following diagram shows a breakdown of IT personnel in a typical large corporation. Please note, the above diagram may not apply to every IT company. For example, a startup company may only have 4 developers and one DBA, while a bank may have 50% of their staff as support and administrative. Based on my 22 years of industry experience, research, and numbers, if I have to put a number behind these jobs, this will be my guess. Cyber Security falls under IT Security. There are 4 million IT Security professionals in the world, according to the news and this number is expected to reach 6 million with most of the growth coming in the cyber security field. There is going to be a shortage of 1.2 million cybersecurity experts in the USA by 2020. There were 2.3 million Data Professionals in the world, according to IBM. The number is probably close to 4 million now. IBM predicts the demand for Data Scientists will soar 28% by 2020. In 2014, there were 18 million ICT skilled workers according to IDC. IT Pros field has been shrinking in the past year or so due to the rise of Cloud and DevOps. If we count both Cloud specialists and DevOps, the numbers are likely to be the same or more. Software testing is a major part of software development. While the number of software developers and QA leads is not confirmed, we can assume 1 tester for every 5 developers is a common practice. That makes it 4.5 million Testers and QA leads. OK, let’s be conservative. Let’s call it 3 million. Each major corporation and IT company has a CIO and/or CTO. CTOs are common roles in small to medium size businesses. Each corporation has several IT Managers and Director of Technology roles. Each large project usually has a dedicated Project Manager. Sometimes, a Project Manager handles multiple projects. Report Writers is another common role in corporations, that does not fall in the development, testing, or database categories. Let’s add these up and call it 2 million. There are millions of people who may not work full-time in the IT field but are involved in doing coding, reports, and other functions as a hobby or part-time gigs.